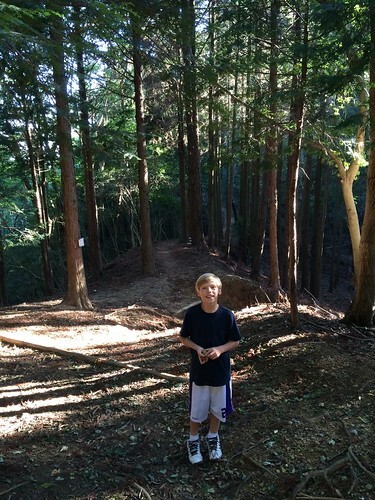 Yesterday afternoon Owen and I went for a walk in the Meiji no Mori Quasi National Park. The park provides the backdrop to the view from our house and consists of forested hills near our suburb. I needed to recharge my batteries and get out into some “wilderness” for awhile, and with the perfect autumn weather we are having this week, it was a refreshing afternoon with my son. The park was set up in 1967 and is called “quasi” because it allows for some development, more so than proper national park. It is nice to have a forest next to a metro area of 17 million people (see last post) and surprisingly, not that many people go up there. That is probably because it takes some effort to go up the hill. There are plenty of marked trails in the park, however, the signs are not in English so we are still trying to figure it all out. We have been in the park a couple of times and we still have not seen any of the famous monkeys. I thought we were lucky yesterday late in the afternoon, but it turned out to be a squirrel. We also heard a strange call from the forest. You can hear it in the video below right at the end. I will do some investigation to find out what it is. I think it might be a monk from a nearby temple. We made it to the further point in the park than we have gone so far. On the other side is pure countryside and will be nice to explore once we get a car. So far it is my favorite place in Osaka.